Week days by appointment only. The Tom Eddy Winery and Cave is located on 22 acres of unspoiled, historical Calistoga landscape sitting 1,000 ft. above the valley floor, surveying both Napa and Sonoma Counties. Here is our home, our office, art studio and vegetable garden, as well as stomping grounds for wild turkey, deer, coyote, mountain lions and even a few long-dead bank robbers (or so they say). and it seems to fit us just fine. We specialize in Napa Valley hillside Cabernet Sauvignon (Tom Eddy Cabernet) with a small offering of Eddy Family hand-picked varietals such as Sauvignon Blanc and Pinot Noir. There are also special offerings that can only be found at the winery. Be sure to come see us. Our new state-of-the-art wine cave is our tasting room and art showcase. Of course there's always the picnic table under the trees on a beautiful day. We call these 22 acres home and enjoy sharing our wine and knowledge with those who are passionate and appreciative of well made wines. View from Tasting Room: 1000 ft above Napa Valley floor with views of Mt. St. Helena and the Palisades. Wine Education: We're UCDavis educated w/40 years in the wine industry. Food Available: Hard to imagine wine without SOME food, don't you agree? To join the wine club, visit www.tomeddywines.com or call 707-942-4267. Special pre-release offers and preferred access to limited bottlings. Tom Eddy Winery is certified under the Napa Green Winery Program by the Napa County Department of Environmental Management (DEM) and the Association of Bay Area Government’s (ABAG) Green Business Program and completed all the regulatory components needed for environmental sustainability. These components included developing water and energy conservation methods, preventing pollution, and reducing solid waste. In addition to developing sustainable winery practices, this program is set to become the standard for the state of California. 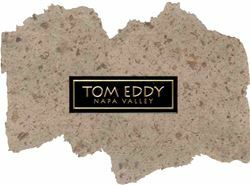 Tom Eddy Winery is certified under the Napa Green Certified Land Program. Tom Eddy Winery has created and implemented a customized farm plan with measured results that addressed all aspects of its property, vineyard land as well as non-farmed land, including practicing soil conservation, water conservation, stable drainage, riparian corridor enhancement, fisheries and wildlife habitat enhancement and long-term improvement and sustainability.